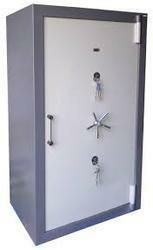 With years of experience, we are engaged in offering excellent quality Fire Resistant Safe. These products extensively used in offices, shops and educational institutes for keeping cash and important papers safe. This product is made available in different stipulations to meet the exact demands of the clients. Clients can buy these products in customized options and at market leading prices. Founded in the year 1964, Prakash Engineering Works is one of the leading Manufacturer, Trader and Supplier of a wide variety of Bangle Machines, Roll Press Machine and Tools, Jewelry Making Machines, Hydraulic Die Press Machines, Sugar Cane Crushers, Strong Room Doors, Fire Resistant Safes, Collar Cutting Machines, Charkhi Machines. These products are fabricated employing premium grade raw material and latest technology. The gamut is applauded all over the market for its low maintenance cost, robust construction, excellent performance, easy operation and energy efficiency. Owing to such quality features. Apart from this, our assortment can be availed in various dimension and sizes matching to client requirement perfectly. we are offering our product under the brand name prakash.